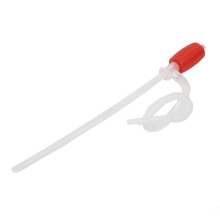 Suitable for use and sale at the gas station, because the length can be inserted directly into the big oil bucket to absorb oil, the air in the airbag can be pumped out of the barrel without having to pump it manually. Easy to operate utilizing a large ball type siphon. Transfers fuel from kerosene container to heater quickly and safely.